Debating Deliberative Democracy explores the nature and value of deliberation, the feasibility and desirability of consensus on contentious issues, the implications of institutional complexity and cultural diversity for democratic decision making, and the significance of voting and majority rule in deliberative arrangements. 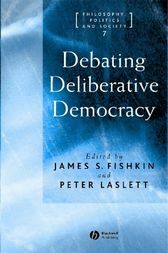 Investigates the nature and value of deliberation, the feasibility and desirability of consensus on contentious issues, the implications of institutional complexity and cultural diversity for democratic decision making, and the significance of voting and majority rule in deliberative arrangements. Includes focus on institutions and makes reference to empirical work. Engages a debate that cuts across political science, philosophy, the law and other disciplines. James S. Fishkin holds the Patterson-Banister Chair at the University of Texas at Austin, where he is Professor of Government, Law, and Philosophy. His publications include Democracy and Deliberation (1991), The Dialogue of Justice (1992), and The Voice of the People (1995). Peter Laslett (1915–2001) was a Fellow of Trinity College, Cambridge. His publications include The World We Have Lost (1984) and A Fresh Map of Life (1989).